got my three storage cubes... but dastardly Michael's was up to their usual shenanigans. unlike all the other times they have had a 25% off total purchase coupon... this one EXCLUDED sale items, i only was able to use the 40% discount. so i could have just bought them last night and saved myself the trouble of going again... but i needed a Starbuck's fix anyways, so it all worked out. i will definitely be doing a post on storage once i get everything set up. 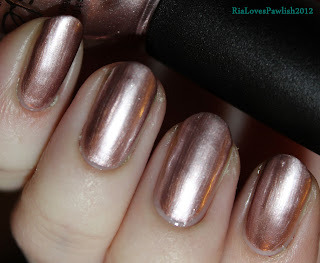 today's post has us looking at OPI Shorts Story and Essie Pure Pearlfection. SS is a gorgeous, saturated pink. it falls on the very cool, blue side of the spectrum. formula was everything OPI usually is, perfect in two coats. PP is from the Luxeffects collection and the best one i've triend thus far. one coat and it turned into sparkly goodness! Pearlfection is a perfect description of this polish, it is a sheer white shimmer inside, totally sparkly outside! two coats SS, one coat Seche Vite. one coat PP, one coat SV. hi, guys! i'm so excited, my husband got me a new laptop because mine is down for the count and he's going to Japan for a couple weeks... now we can Skype! Skype is such an awesome invention :) also, i found the storage containers i've been looking for at Micheal's, tomorrow they will be 40% off plus 25% off the total purchase! i might buy all three they have... nine drawers will make organizing so much easier! i found this idea on The Daily Varnish, the specific post is Here. go visit these girls, they have an amazing bloggie! today we have Zoya Julieanne topped with Essie Set In Stones. Julieanne is a gorgeous metallic purple, easy formula which is opaque in two coats! it's a gorgeous color... which flat refused to photograph true to color! i'm SO frustrated... i probably took three hundred pictures and this is the closet i could get. >.< it photographed completely blue in almost all the pictures! grrrrrr. SIS is another win from the Luxeffects collection! paired with Julieanne, the two combined make the manicure look like a midnight sky. SIS is a silver glitter which has large hexagonal and tiny round pieces in a clear base. took only one coat and i didn't put on topcoat, it was super sparkly all on its own! however, if i wasn't just swatching i would have added topcoat because it is very rough and scratchy. two coats Julieanne, one coat Seche Vite. it does usually look a little warmer in person! well, i bought storage drawers, but not the ones i was looking for... none of the craft stores had them! the one i ended up with is cuter than the one i was looking for, but has less room. one huge benefit... this one came already assembled! today we have Orly Snowcone, a cornflowery cream topped with Essie As Gold As It Gets, the gold shimmery polish from the Luxeffects collection. the formula on Snowcone is awesome, so close to a one coater!! it was really easy to work with, i have no complaints at all. 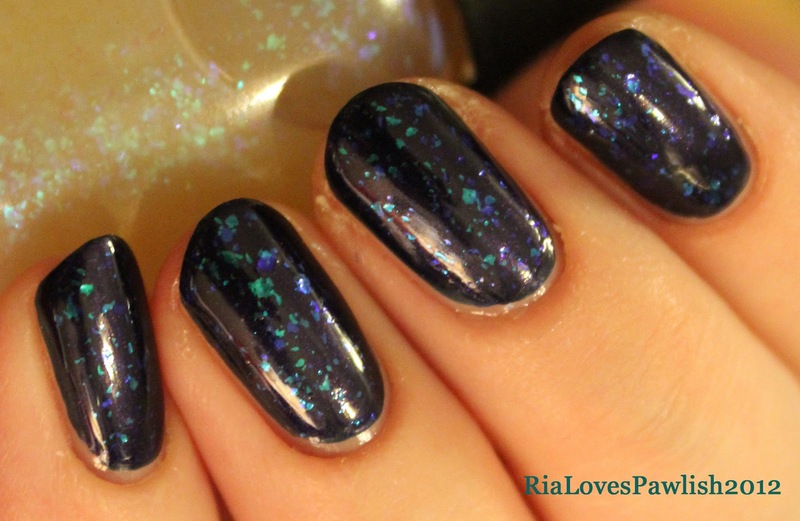 while the polish looks dusty in the bottle, on the nail it is a saturated, soft mid-range blue. AGAIG is a gold micro-glitter. i can't tell if it has a slightly gold base or if the glitter is so dense it appears to have a colored base! it flashes hints of orange, pink, and green. 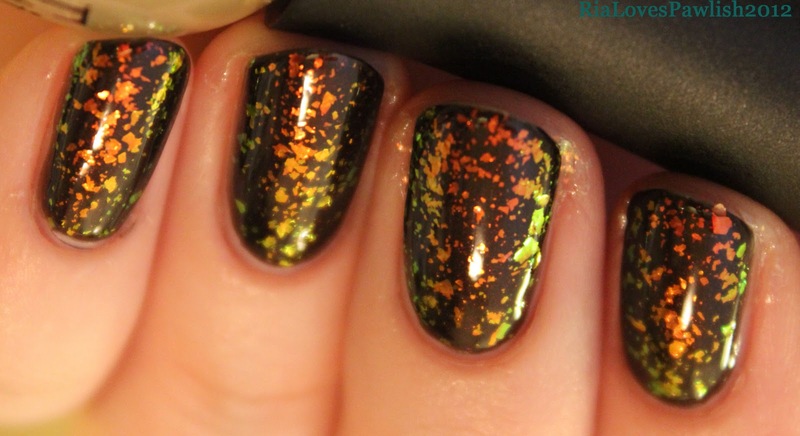 those colors are very slight, but really add to the depth of the polish on the nail. i wasn't sure if the gold would look good over the blue... i'm so glad i went for it. they compliment each other perfectly... check out the swatchies for yourself! 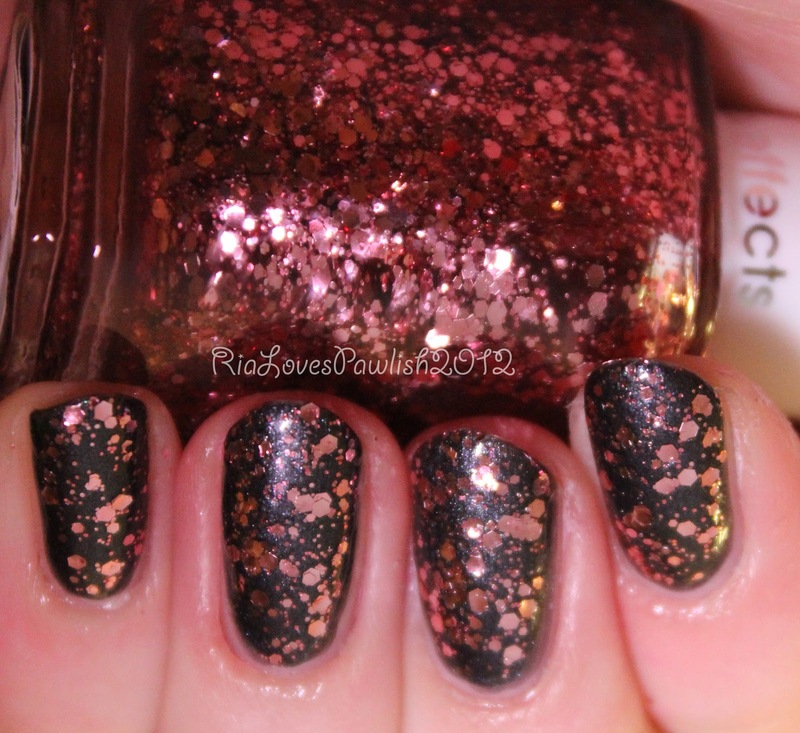 one coat Seche Base, two coats Snowcone, one coat Seche Vite. one thick coat AGAIG, two coats Seche Vite. i'm really frustrated, apparently the storage unit i want for my polish is on strike... i've been to multiple stores and none of them have the three drawer cube! seems like the second you start looking for something, it is nowhere to be found... and once you finally aquire it... you see it everywhere! today we're looking at some gorgeous winter blues, Essie Borrowed & Blue and Essie Barbados Blue. two different finishes filled with icy goodness! Borrowed & Blue is a light, cool blue cream which skews slightly towards robin's egg blue, but is not nearly as saturated. two coats, perfect with no streakiness! in some lighting, it is an even a lighter, brighter shade of blue! Barbados Blue is Borrowed & Blue's frosty little sister! it is a true frost, complete with brushstrokeyness. if you hate that look, definitely skip this one! i used only one coat over Borrowed & Blue, that's all i needed to give the manicure a whole new look. 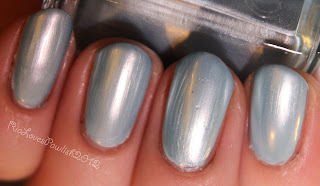 one coat Seche Base, two coats Borrowed & Blue, one coat Seche Vite. one coat Barbados Blue finished off with one coat SV. today's polish is Zoya Dove. it's exactly like a dove's coloring... a cool, soft greY cream which translates to being effortlessly chic. i used three coats to get rid of slight patchiness; it wasn't visible until you looked at it really closely... it also was only visible from a couple angles (since i tend to add an extra coat anyway, it's not a big deal). i have to say i'm completely in love. greY is my favorite color (along with pink) and it's such a light hue, i have nothing like it in my collection... all the others are much darker and most are warm tones. i have started using Seche Base under my manicures (i was using Seche Clear) which dries to a sheer pearly white... you could actually use it as a polish on its own! definitely adds a huge benefit when using colors that tend to be on the sheer side; however, i forgot to use the base on my thumb and it looks exactly like ones with the base. actually, all the Zoya polishes i've used are incredibly pigmented, so a colored base isn't necessary! now for the swatchie! one coat Seche Base, three coats Dove, one coat Seche Vite. this color dried Seche Vite shiny with NO SV! however, like most Zoya i've tried... it flat refused to dry! other than that, this polish checks off everything i could possibly wish for. i really can't recommend this highly enough. if you love greY or just chicness, you NEED this color in your life!... just make sure you have Seche Vite on hand to dry it. 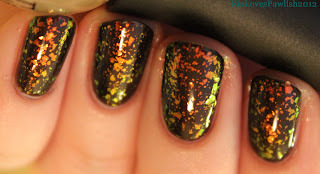 today we have a fun manicure of shatter over glitter. the glitter is OPI Sparkle-icious topped off with OPI Turquoise Shatter. i layered one THICK coat of Sparkle over a purple base. it's made up of gold, blue, and plum glitter. it adds up to a fun party look all on its own... throwing TS on top amps it up to fab party look! the TS is nice and opaque pearl. it looks more like teal (especially because it's pearly) than a true turquoise. 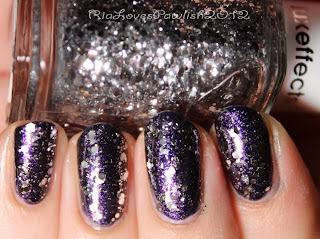 one coat Sparkle under one coat Seche Vite. one coat TS topped with one coat SV. 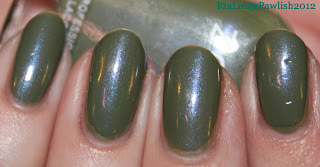 quick post today, we're looking at China Glaze Near Dark. it's a strange color... a very dark olivey green/baby poop. i know, so gross, right?! it does just look like a dark brown/green built up. first coat is a streaky mess (plus has that gross color), second coat seemed to cover fairly well. i say seemed because when i took the photos, a few pretty wretched looking bald spots showed up. they definitely aren't noticeable in real life unless someone has their nose on your nail... and i sincerely doubt that would happen! i wouldn't have bought this color if i had not gotten it on sale; i don't know if it was worth the $5.49 i paid for it and i definitely can't say i recommend running out to buy this color! two coats topped with one coat Seche Vite. quiet Saturday, my husband picked up a white pizza for lunch... so good! i like to just invert my favorite pizza. which means, i have cheese on the bottom and tomato slices on top. not adventurous, but quite tasty! today yields yet another dreamboat color, Zoya Marley. i'm in awe over the opacity and color payoff of Zoya polishes... they are beautiful in the bottle and completely delicious on the nail! i used three coats to even everything out... but, i'm confident it would only take two coats if i could just get a handle on how to use these teensie little brushes! i can't believe how much i'm struggling with using traditional brushes. the big fat OPI brushes really throw off how you approach nail painting with any other type of brush. plus, the Zoya brush is tiniest one i've seen. Marley is a light lavender with a hint of pearl essence that gives it depth. i love colors like this, and Marley stands out against competition. this is three coats (which dried fairly shiny) topped with one coat of Seche Vite. today we have Nicole by OPI You're S-teal The One. 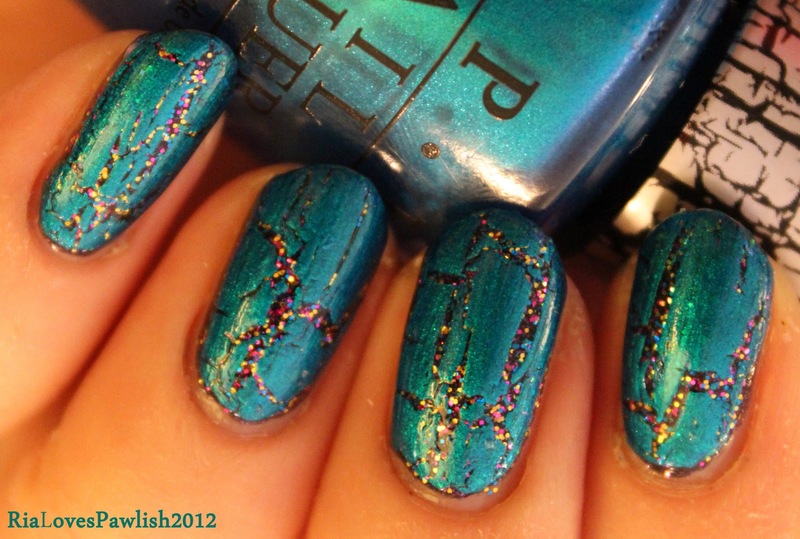 it's a brilliant blue foil with a slight pink reflect... i really like it... but the formula is a major let down. i used three coats, but color refused to stick to the ends of my nails! so, even before i added Seche Vite, it had the appearance of tip wear... bright light makes it even worse! i would also have liked for the reflect to show up a bit more... but that's always the wish with reflects, they are very shy! i added two coats of SV to make it superrrr shiny. surprisingly, SV did not cause the polish to shrink back very much from the nail tip... usually SV is the cause of the faux tip wear effect. the other surprise is that when i woke up today, all the SV glassy shine was gone! it basically looks like no topcoat was applied at all... can't explain that. major bums because nails can't be too shiny in my book! i chose this swatch because it shows all the ways this polish can appear due to different lighting. metallic foil (remember that because the camera such close images, the shimmers lessen and look far more foil like in real life! 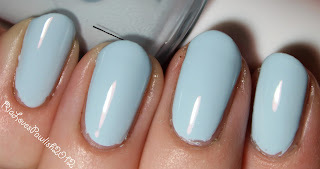 ), deeper blue in the shade, the anemic tip of the nail, and finally, the slight pink reflects at the sides. somehow i'm not enjoying this color very much on this second day... maybe it's because i had a bad morning? didn't feel well at all this morning, so my mom had to go to the big move seminar by herself... and it turned out that the receptionist had given us the wrong seminar day! how lame is that?! since she gave the wrong date to multiple (!!) people, the advisor went ahead and gave the correct info packets and stuff to everyone. 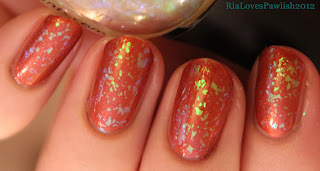 today's polish is China Glaze Celtic Sun (Neon)... yep, (Neon) is on the label! and it certainly is neon highlighter colored... which is super fun on the nails. the camera did it's best but it absolutely could not capture how bright this color actually is! in some lights the color looks exactly like the photos... but in others it is a blinding neon! the formula was a complete nightmare. i used one thin coat followed by three thick coats, but still some fingers looked a little streaky. not noticeable to the average bear, but it bothers me. it dried very matte, i have photos of both the matte finish and a topcoat finish. if you are like me and have fairly oily skin, it is not going to stay matte for long... any time you touch your nail it becomes more and more shiny. four coats plus one coat Seche Vite. today's polish is Nicole by OPI One Time Lime. this is my first review of the brand, but not my first time actually using it. the colors are easy to work with and cover in two to three coats. the new 'Perfect Stroke' brush is AMAZING! i think i like it better than OPI 'ProWide'... and that's saying a lot. (future post :: brush breakdown!) the traditional brush is okay, about the usual... easy to work with because the polish itself is easy to work with. the new brush totally amps things up! OTL is the color of most sour apple flavored candy... not an actual apple. it's not the color of an actual lime either, the polish has a more saturated color. well... let's leave at it's a beautiful green! i used three coats, however, two would have been sufficient. as usual, i want my nails to look far more thick than they actually are! it dried really shiny, but i did top it off with Seche Vite... because it can't be too shiny!... right? quick tip :: different types of lighting can cause this color to have a much yellower undertone. so glad my husband had the day off today... it made a really nice start to my week :) think i'm going to head down to where i grew up sometime this week... not so nice! at least it'll just be for the day, then back to beach. 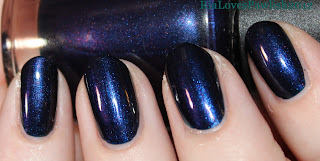 today we're looking at Orly Galaxy Girl, a purple and blue metallic duochrome. this is my first time ever using an Orly polish. it wasn't awful, it wasn't astonishingly great. my major complaint is that if you don't match the coats up perfectly, there is a yuck looking plum color left behind. bottom line... beautiful color, easy application (opaque in two coats), but not run around the house screaming BEST POLISH EVER good. i have a multichrome from them that i'll be swatching in the next week or two. i'm curious to see if i like that better since i have more of a handle now on how to best apply it. here's the swatches! GG two coats, topped with one coat Seche Vite. today we have the famous China Glaze For Audrey. i have to say, i'm disappointed that it isn't closer to the actual Tiffany blue... it's a few shades darker than the real deal. it does have a good formula that covered nicely in two coats. these first China Glaze polishes i've been using seem to have a consistency that tends to dry lumpy... but again, that could be user error! as i continue swatching away i will keep you all updated! just for funsies, i swatched FA on my Tiffany bag and box! i just can't force myself to throw away any of my Tiffany boxes... they ooze happiness in a little blue box :) the little bag is a closer match than the box... but i have had multiple colored bags even within the same order... seems like they could use a little quality control? i just feel like the gold standard in jewelry should be a little more consistent. the boxes, however, are always the exact same color. without further ado, here's two coats FA topped off with one coat Seche Vite! woohoo Friday! went to Ulta and had a great reason to avoid the grocery store... a surprise visit from one of my best friends! plus, my husband has a three day weekend... cheers to a fabulous weekend! 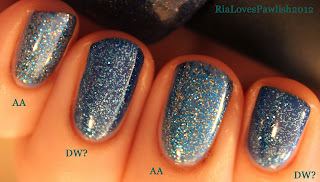 today we're comparing the blue glitters OPI Absolutely Alice and China Glaze Dorothy Who?. i layered them both over China Glaze Secret Peri-Wink-Le. 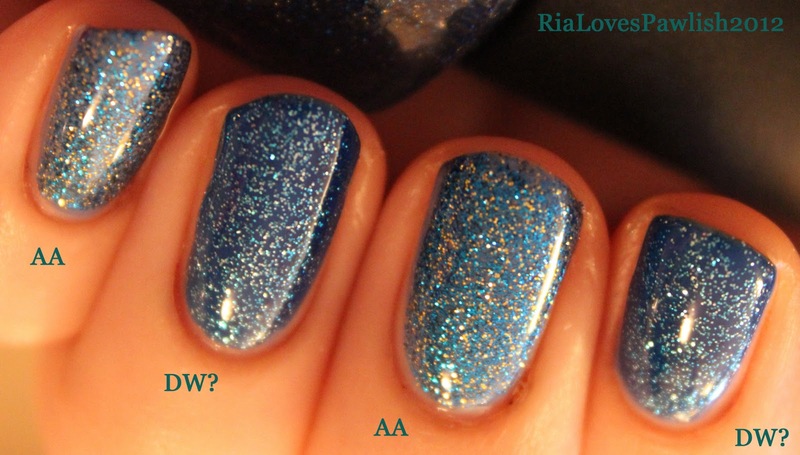 AA is a warm toned blue glitter that has gold glitter mixed in a clear base. DW? is a cool toned blue glitter with silver glitter in a blue jelly base. both only took one coat over SPWL to give a completely opaque look. 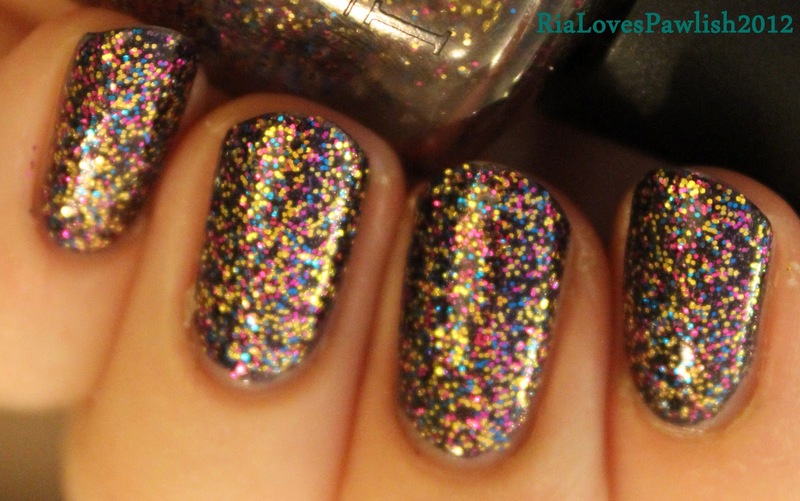 you actually cannot even see that there is lighter color underneath the glitter! i do prefer DW? because i tend to go for cooler colors, and i definitely love silver more than gold! the blue jelly base does give more depth as well. i did have to GLOB on the Seche Vite to get the shiny glass look on both of them... that's my only complaint! 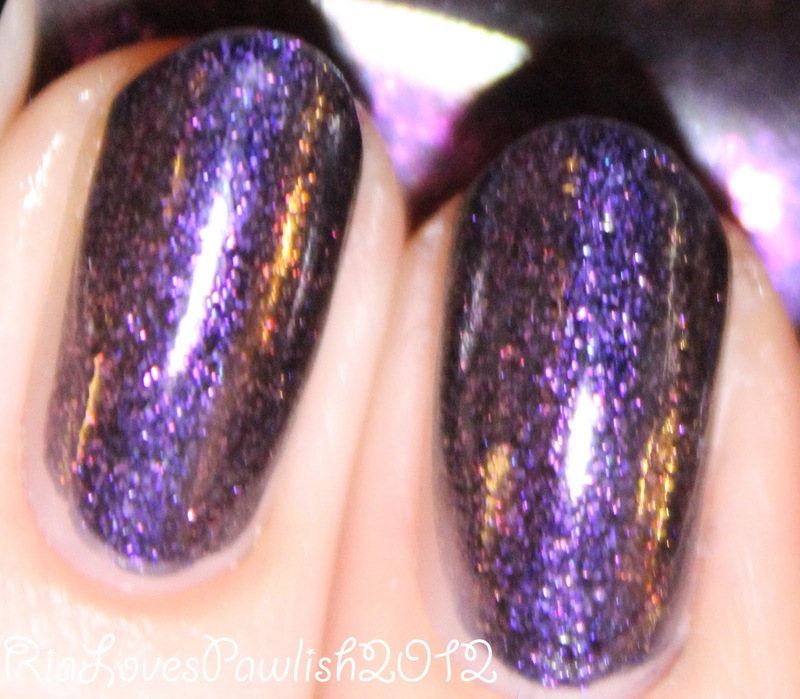 here are a few shots showing the polishes at different focuses so you can see the colors of each glitter and then how much it sparkles... on to the swatches! here's the close up... you can see how dense the glitters are! and finally, check out that sparkle! Happy Thursday! no Ulta today... tomorrow it is! sadly, i also have to go one of my most dreaded places... the grocery store. yuck! 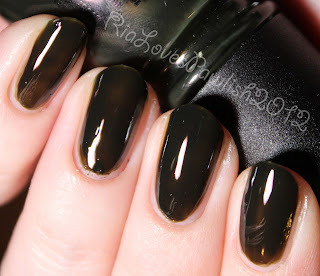 today we have the first swatch of a basic color polish that is not OPI! it's China Glaze Secret Peri-Wink-Le. the name seems lame to me... are all the dashes necessary? i get where they were going with it, but... ick on all the dashes! SPWL is a gorgeous blurple (blue purple) cream. the color is beyond gorgeous. it is truly the color of periwinkle flowers. wish i had a flower to take a picture with the polish... but i live in an apartment complex that doesn't plant them AND it's winter! i used three coats... but i'm marking it down to user error because it's literally the first time in years i've used a traditional polish brush with regular colored polish (not topcoats). i do prefer the fatter brushes, but the skinny ones aren't terrible. here's three coats SPWL topped with one coat Seche Vite. 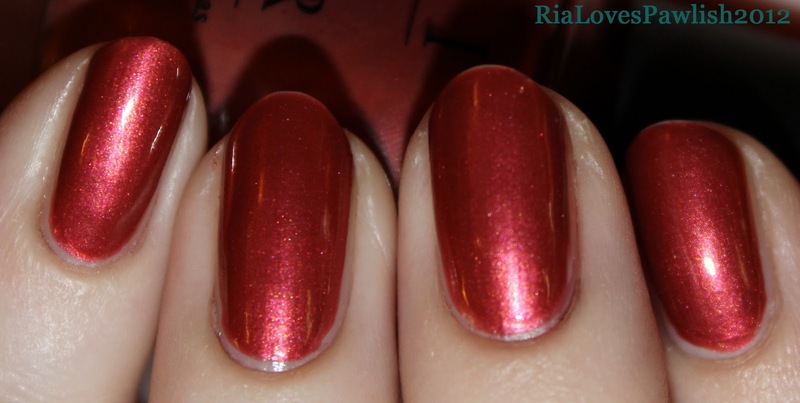 a comparison of OPI reds is what we'll be looking at today, along with OPI White Shatter. 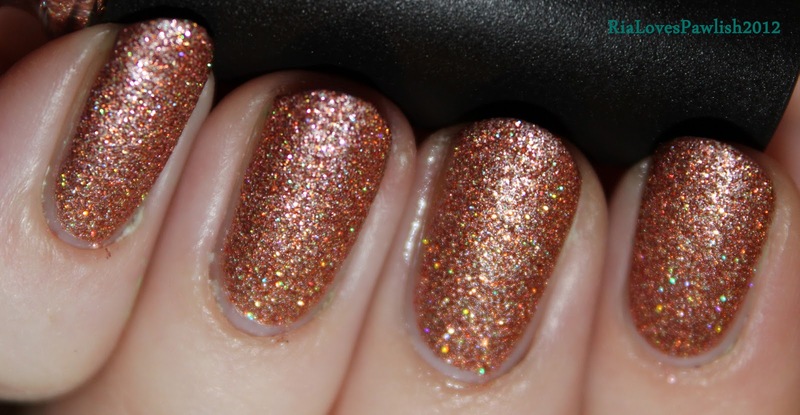 first up we have OPI Speak For Your-Elf! 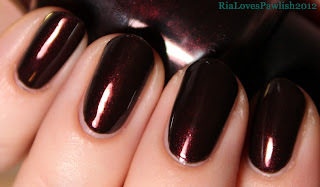 (from Ulta's exclusive Christmas 2011 collection). 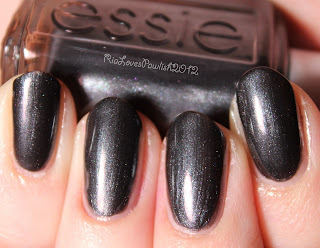 it is sparkly metallic goodness, completely opaque in three coats. i would have preferred two, but it's worth the added coat! 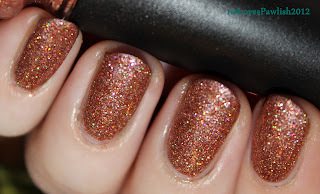 it has warm undertones and is so glittery it could *almost* qualify as a complete glitter. if i could only have one red, this would be it, hands down. it's brilliant for the holidays, but gorgeous year round! 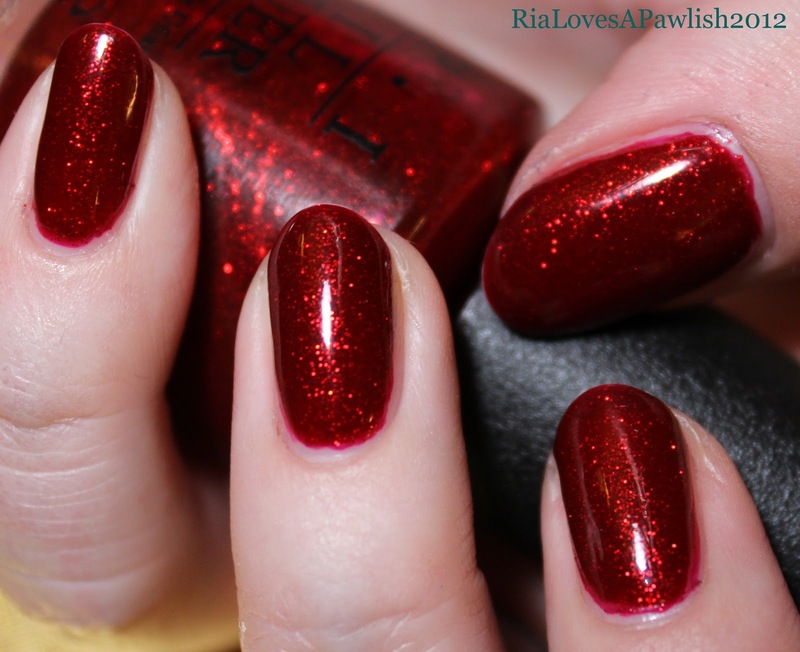 red should definitely be a staple in everyone's polish collection. OPI An Affair In Red Square (Russian Collection) is a cool toned red pearl. doesn't lean frosty or shimmery... a true pearl! in the bottle these two reds look far more similar than they do applied to the nail. in the bottle, SFYE sometimes looks like your regular run of the mill red... but it never looks that way on the nail! AAIRS probably has lots of dupes, i don't own any though. in the bottle it looks like a great dupe for OPI I'm Not Really A Waitress, which most say is a must for every collection... gotta get it one of these days! sorry the swatch of AAIRS is so blurry... it's the closest i could to the true color of the polish without showing shimmers that do not show up at all in person. it is still a *little* more cool toned than this, sorry guys!! two coats AAIRS topped with one coat Seche Vite. OPI White Shatter is my favorite crackle... i have never disliked it paired with anything! it's the one i always reach for... i guess it helps that i love wearing white polish by itself. but, that is definitely not to everyone's taste :) the key to crackles is shake them up REALLY well. it doesn't make air bubbles like it would in a regular polish. the formula went gross after a couple uses, which really ticked me off! shaking it brings it back to the original (or close to it) consistency. like most crackles, it dries very dull. one coat WS over SFYE and topped with one coat Seche Vite. went to the Virginia Living Museum today... and found i had forgotten to charge my camera's battery! so frustrating :( but since we're members it isn't that big of a deal, i guess. all the animals were out playing today which was awesome! my husband's favorite animals are otters and i love... well, all animals, but especially anything canidae :) they have red wolves there, i am happy just to stand and watch them for hours. the museum participated in the government's captive breeding program a few years ago; the three wolves they have now are the father and two sons. how cool is that?! and now, the polishes of day... and i'm happy to report we are back to the flakies! 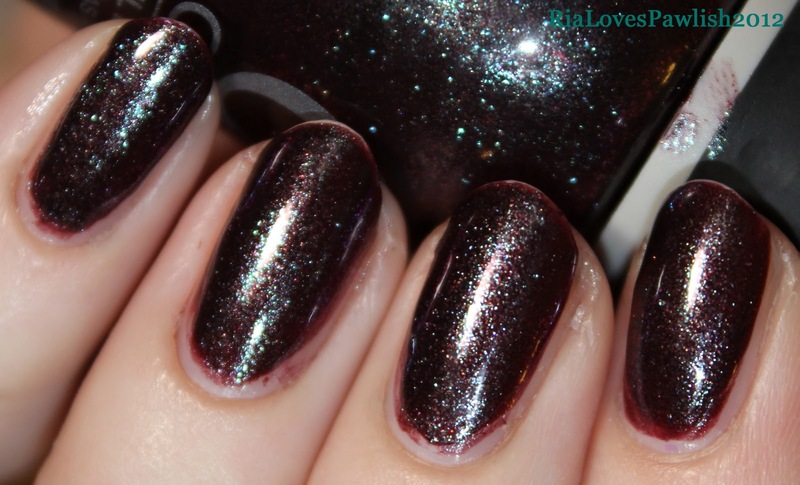 today's flakie is Finger Paints Flashy (get the Special Effects collection at Sally's now *January 2012*) layered over OPI Midnight In Moscow (Russian Collection). this combination is my favorite so far, everything about the polishes complement each other! two coats MIM topped with one coat Seche Vite. 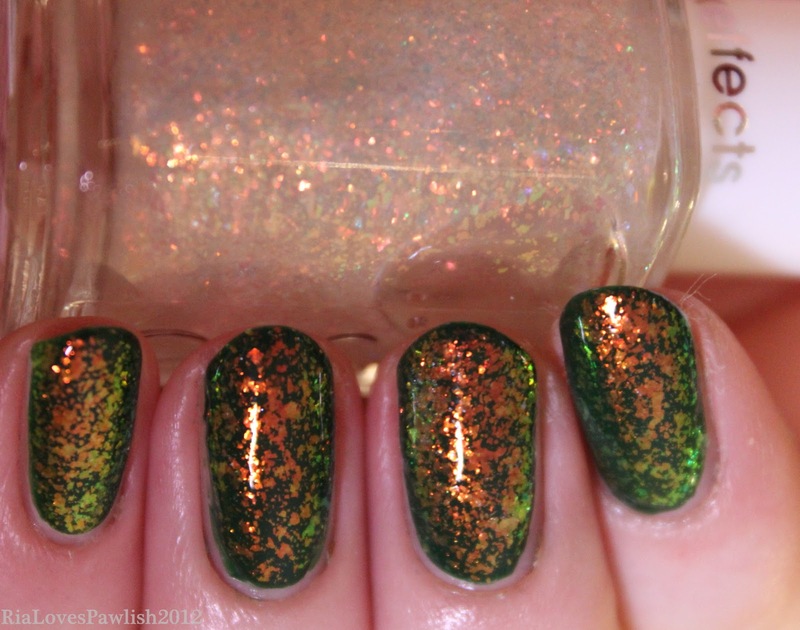 Flashy is a combination of green and orange flakies... there is really nothing bad to say about this polish! it is so easy to work with, one thick coat is all you will need. on the other flakie post i said that they should be topped off with two coats of Seche Vite... this one dried so shiny it could almost have been left alone. adding just one coat of SV made it SUPER shiny! sadly, i have to interrupt the Finger Paints flakie series for a simple OPI swatch. today has been crazy! it's already 11pm, so i'm barely even making this post while it's still Friday! 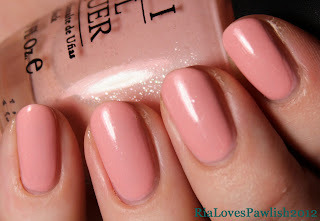 we're looking at OPI Fair Dinkum Pinkum, a light pink with glass flecks. i have to say, i'm really not a fan. it's got a watery, thin formula that took four coats to build up to opacity. however, it is thin enough that it was easy to keep air bubbles at bay... so, what you see that looks like air bubbles is actually the glass flecks. they are GORGEOUS in the bottle, but once on the nail they are very, very sparse and just give the polish a yucky look. 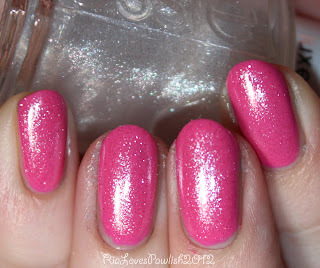 i'm also going to show OPI Pink Friday from the 2012 Nicki Minaj collection. four coats FDP topped with one coat Seche Vite. and that was three coats of Pink Friday with one coat Seche Vite. as you guys can see, PF is a saturated blue pink, while FDP is a neutral beige pink. if you only want one light pink, there is no contest in my opinion... Pink Friday is the way to go! hopefully, we'll be back to the flakies tomorrow! hi, guys! while i've been editing i've had World's Dumbest Criminals on in the background. i've seen this episode multiple times but i never get tired of any of the World's Dumbest episodes! my dogs went and hid because i laugh so loud it freaks them out... *sigh* it's just so funny! today from the OPI Russian Collection we have Catherine The Grape. 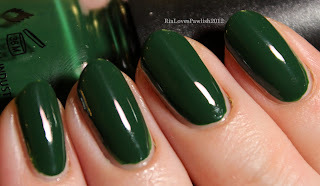 this polish is strange... when i look at in the bottle, i hate it and i can't remember why i liked it so much. when it's on, it looks nothing like the bottle color! it turns from a dusty drab medium toned purple to a gorgeous rich plum that is close to a frost, but leans more towards a pearl. it you can see some brush strokes but i actually don't mind them, i think i'm one of the few polish fanatics that still loves a good frost! it has a great two coat formula, too! 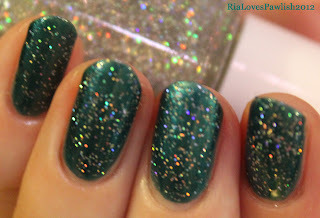 from the 2011 Finger Paints Special Effects Collection (available January 2012 from Sally's) Asylum is a fantastic flakie with predominately blue and orange flashes, but has limey green flashes from different angles! here's two coats of CTG topped with one coat of Seche Vite. and one thick coat of Asylum with two topcoats of Seche Vite.